Top golf courses located in Central Florida! Get premier lodgings near the premier courses! Come see why Florida is a destination for golfers. Featuring some of the most pristine and well-known courses, from designers such as Greg Norman, Jack Nicklaus, Arnold Palmer, and Tom Watson! Don't forget about the David Leadbetter Golf Academy! Check out how Alpha Vacations can fill all your golfing needs! Featuring 2 separate courses, in one convenient location! 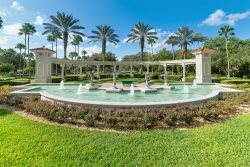 Two totally different Greg Norman signature designs married with Florida�s natural habitat, with every hole featuring beautiful natural vistas. With its 36 holes of championship golf, its Orlando�s best golf outing and tournament venue. Crafted by renowned architect Ted McAnlis, who has a fantastic reputation among seasoned golf lovers. Ridgewood also boasts Champions Turf greens, new bunkers, leveled tee boxes, lush landscaping and impeccable grounds maintenance. This Davenport golf course ranks among Florida�s must-play facilities. Welcome to the World Headquarters for The Leadbetter Golf Academy! As the crown jewel of the 34 golf academies worldwide, the World Headquarters offers the very finest learning and practice facilities to help students "Build a Lifelong Game." Proud to provide the world`s finest instruction at a location that was hand selected and designed by David Leadbetter himself to give his students the ultimate learning experience. 3 separate courses all in one location! Featuring Signature Designs by 3 of golf`s greatest legends: Jack Nicklaus, Tom Watson and Arnold Palmer. Combining the beauty of their natural landscaping with unique and challenging layouts, these courses have won numerous awards and followers over the years. One of the most unique courses Florida has to offer. Located on one of the highest elevated areas of Florida, Highlands Reserve gives you breathtaking sights and views as you enjoy a challenging, yet rewarding game of golf. With 80-foot elevation changes, rolling sand dunes, mature oaks and large wetland areas, the par 72 course offers two distinctly different nines. The �low country� style front nine is reminiscent of classic Carolina courses, meandering through native wetlands and marsh areas, bordering oak and cypress forests. The back nine features the characteristics of a British Isles links course, with extensive perimeter mounding and pot bunkers, and lush, rolling fairways. This dramatic hillside layout stretches to over 7,200 yards and features 100 ft. of elevation change, large undulating greens, massive high lipped bunkers, Dunes that are covered with high grasses and ornamentals, which form borders that tumble with the terrain. Located in the quaint town of Celebration, this course`s design delivers a golfing experience that can challenge the pros and yet offer a rewarding time for juniors and those just learning the game. As you traverse the course, it will take you on a journey through the peaceful town.